When I was living in DC, I worked at a publishing company, writing business-to-business compliance manuals and newsy bits about environmental law. It was a pretty big office, maybe 60-80 people, and there was a core group of folks that I would make coffee-machine conversation with. One of these people was L, a triathlete and journalist who once advised me to never swim a mile, because he said I’d then be obsessed with swimming a mile, and stop enjoying swimming. He was mostly right, also chlorine. “Mud?” I asked? But why? How awful! It turns out that the way that the Anglo speakers said her name, “Marisa,” with the change of that first vowel to more of a schwa, together with the fact that they didn’t roll their rs, but instead made a single flap for her name, made it sound like “Mudisa.” So “Mud” stuck. Pun unintentional, but I noticed it, too. So Mud got me to thinking about the approximation of sounds in other languages, for when you don’t have or aren’t accustomed to making a sound in your native language. And one that comes up often here in Chile is /u/. The u of cup, the u of mug, the u of cut, of Tupperware, of duck, or a four letter word that rhymes with duck. Why do I mention Tupperware? You’ll find out in a minute. Spanish doesn’t have this uh sound, precisely, so people search around in their mouths/brains/someplace else to find the closest available sound. Often, in the case of /u/, it comes out /a/. Cup becomes cap, and mug becomes mag and pub becomes pab. The truth is, it’s probably close enough, and it doesn’t cause any communication problems, and really, who cares. 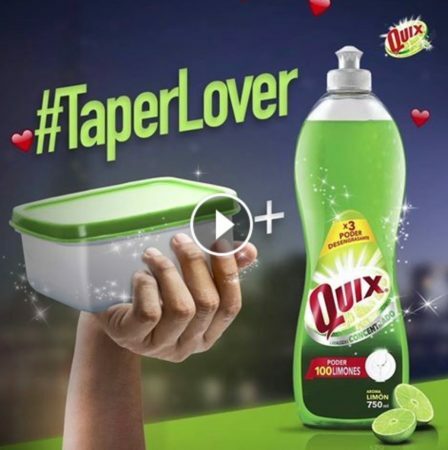 Unless you are an English speaker trying to parse out just what in the world a TaperLover is. TaperLover suffers from a couple of serious spelling issues. In English, if we were to abbreviate Tupperware, it would be Tupper, not Taper. Lost double letter plus vowel change. Some friends of mine and I considered that the advertisement could be aimed at people who love people who tape things, audio or physical. But that’s just silly. It’s about people who love imitation Tupperware. And that is so self-evident. And I am also not above losing double letters and using the wrong sound. Why, I myself just figured out the other day while whatsapping (which in Brazil is referred to as “mandar um zap,” but here it is just whatappeando or mandar un whatsapp“) that I have been saying the word for calf (leg, not cow) wrong for the whole time I have known it. I have been saying pantorilla, instead of pantorrilla. No one, but no one cocked their head to the side and said “what?” I talk about my calves as much as the next person (spoiler, maybe more, cycling and skating and the occasional injury). To be fair, my misspelling and mispronunciation of this word was not because I was incapable of making the right sound, but because I didn’t know that it was required. I actually have such a mean double r, that it sometimes comes out when I don’t even want it to, Again, not a huge deal. So really, these small differences like “feeding the dacks” and “having a cat on your hand” are not a big deal. They serve as a tiny shibboleth, or in-person test to know whether someone’s native language has the vowel sounds I grew up with. Unimportant, transient, lost in the ether as soon as the word floats by. Except for when they are graffitied on walls. Missed it the first time? Here is is again. I don’t know why the u turned into an o here. 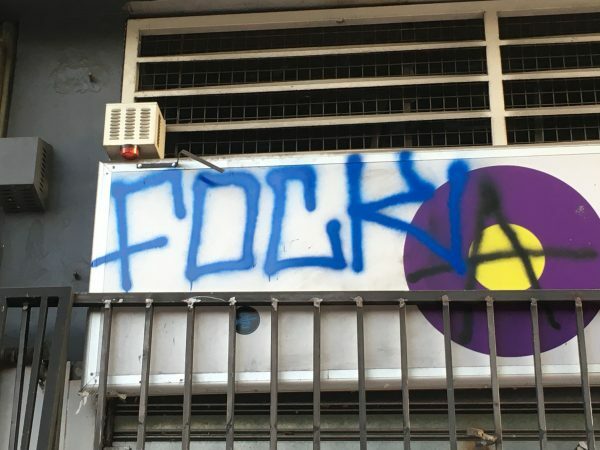 Maybe hypercorrection, after having read this piece I wrote about graffiti containing the word madafaca, and realizing the o was off, they went the other way. I don’t know how you get a /u/ into your set of vowels if you didn’t come with one from an early age. I don’t think it’s like a missing piece of Lego (shout out to my nephew) that you can ask to have sent to you to finish the set. And I don’t think I will ever be 100% sure to hear the difference between the word for “it was burning” (ardía) and the word for squirrel (ardilla). 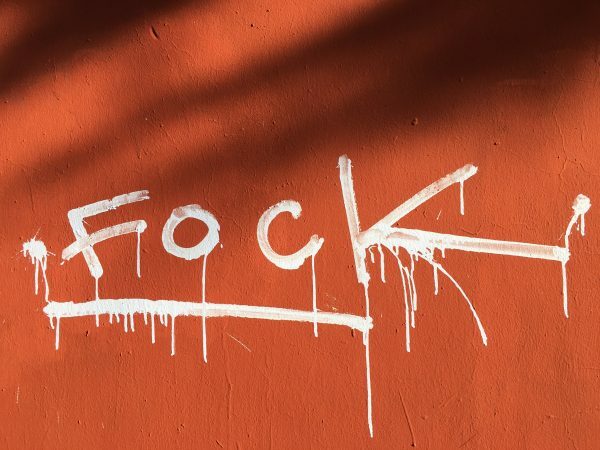 Thank goodness there’s always context, for fock’s sake. Whoever he is. In Buenos Aires you can hear the difference between ‘ardía’ and “ardisha”. Tupperlover hubiese sido un concepto complicado acá en Chile, considerando que la gente, y sobretodo los hinchas del club de fútbol Universidad Católica aún lloran el suicidio del jugador Raimundo Tupper en 1995. Era un buen jugador, muy querido por los fanáticos y por sus colegas de profesión, pero padecía de depresión endógena, la que lo llevó a tomar la drástica decisión de lanzarse de un edificio en San José de Costa Rica, donde su equipo iba a jugar un partido amistoso.